Irene Kampen’s divorce led not only to a new career, but a popular TV series starring another recent divorcee, Lucille Ball. Kampen and her husband, Owen, moved to Ridgefield in 1954 and almost immediately, their 15-year marriage fell apart. “I was brought up to believe that if you cooked, dusted and baked blueberry muffins for your husband, you would both live happily ever after,” Kampen said. “Well, I dusted, I baked and one day I looked around our house, high on a Ridgefield hill, and ‘George’ was gone. Forced to support herself after the divorce, she was soon exhausted commuting to work at her father’s New York City flower shop, and turned to writing. A few years later, she produced the light-hearted “Life Without George,” published by Doubleday in 1961, based on her new life as a single mom. The book became the inspiration for The Lucy Show, a comedy about a divorced woman starring Miss Ball, who had recently divorced Desi Arnaz. 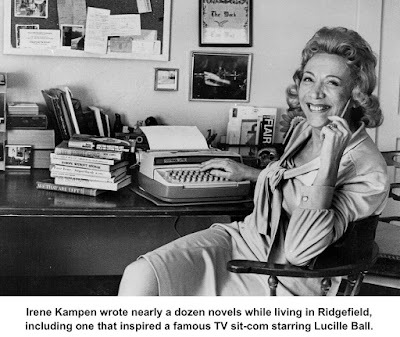 Many changes were made from book to sit-com script, including the elimination of Kampen’s two cats — “Cats are untrainable and impossible to use in a show filmed before a live audience as is ‘The Lucy Show,’ ” explained AP TV-radio writer Cynthia Lowry. Ball won two Emmy Awards during the show's seven-year run. Although she wanted to, Kampen never did get to meet Lucille Ball. She probably did meet Vivian Vance, who played Ethel Mertz on both I Love Lucy and The Lucy Show — Vance lived on Route 116 in nearby North Salem. Irene Trepel Kampen was born in Brooklyn, N.Y., in 1922 — her father, Jack, who later lived in Ridgefield, owned a flower shop in Rockefeller Center, was an amateur magician, and was president of the American Society of Magicians for 12 years. Her mother Mary co-starred in Trepel’s magic shows, including on USO tours in World War II. Kampen attended the University of Wisconsin where she was editor of the campus humor magazine and graduated in 1943. She worked for a while at The New York Journal-American and after her marriage, moved to brand-new Levittown, Long Island, where she worked for the local weekly newspaper as a reporter and gossip columnist. Soon after her divorce, she began writing pieces for The Ridgefield Press, including a column under the pseudonym, H. Loomis Fenstermacher. Kampen enjoyed pulling off stunts, as well. One time, to draw attention to how long it took to get a walk light on Main Street, she set up a typing stand with typewriter on the sidewalk by town hall to suggest she had enough time to work on a novel while waiting for the walk light. Irene Kampen moved to California in 1988 and died 10 years later at the age of 75. How did Owen Kampen feel about becoming “George” to millions of readers and viewers? In a 1961 letter to The Press, Owen, a commercial artist who did many pulp fiction covers and taught at Famous Artists School, said he had picked up a copy of his ex-wife’s book soon after it came out and began reading it with trepidation. And if that praise from an ex-husband wasn’t surprising enough, consider who selected Kampen’s book as the model for Ball’s new show: The head of Desilu Productions, Desi Arnaz.